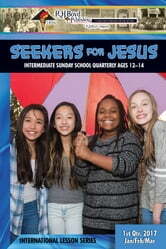 Seekers for Jesus is a quarterly written especially for young people ages 12-14. In addition to introductory material and biblical exposition, each lesson contains a section to help students apply the lesson to life. Questions are interjected to gauge the student’s understanding of the presentation. A Question for the Devil: Is That All You Got?